I'm trying to rise a ship out of the water (an ocean) and have the fluid curve around the hull before it drops off the boat. I know there is a sticky option in the solver which doesn't really do the trick when it comes to the flip tank. Is there a way around this someone could explain? I saw some other posts about this but it wasn't using the flip tanks. Here is a file I found on this site that used a sphere as the object rising up out of a flip tank. I went ahead and replaced the sphere with a starship and the effect seems to hold up ok. You can always push it a little more with lower particle separation or play around with viscocity. Maybe tighten up the collision mesh too. Hey, thanks a bunch! My ship isn't coming up from underneath the surface is the only thing. 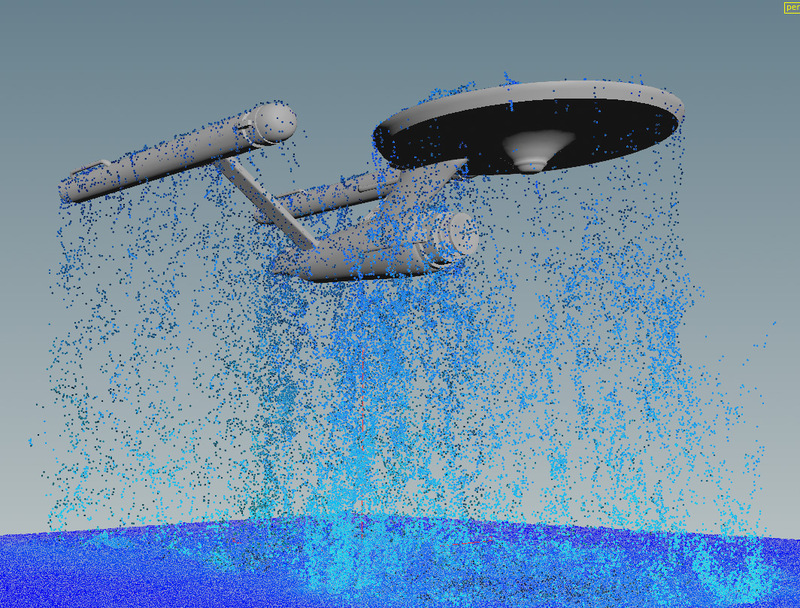 When I submerge an object it looks pretty good, but if the ship is already out from the surface, the particles just don't stick to the bottom surface and curve towards the bottom like you would think they would. I'm gonna open this file and take a peek. Thank you again. This is totally what I'm looking for. I grabbed this file earlier from this forum and can't remember where I got it, or else I would totally give props to the author! The sphere on the left is doing what I would think a large hull emerging from the ocean would look like, water wrapping a bit before it let go.